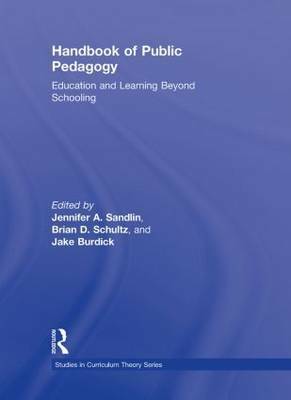 Bringing together scholars, public intellectuals, and activists from across the field of education, the Handbook of Public Pedagogy explores and maps the terrain of this burgeoning field. Jennifer A. Sandlin is Assistant Professor in the Division of Advanced Studies in Education Policy, Leadership, and Curriculum, Mary Lou Fulton Institute and Graduate School of Education, Arizona State University. Brian D. Schultz is Associate Professor of Education, Honors Faculty, and Associate Chair of the Department of Educational Leadership & Development at Northeastern Illinois University in Chicago. Jake Burdick is a doctoral student in Curriculum Studies at Arizona State University.